West Bronx CM Ritchie Torres is running unopposed in the Democratic primary as Jayson Cancel has dropped his bid to run for City Council in CD15. Cancel, however, will be on the November ballot as a Republican. Riverdale/Kingsbridge CM Andy Cohen is also spared a Democratic primary fight. Republican John Cerini and Patrick Delices are the only Bronx Republican Council candidates participating in the NYC Campaign Finance Board’s matching funds program. CD 8, John “The Rappin’ Fireman Ruiz and Ed Santos dropped of the race. CD13, Lucia Giraldi, John Marano and Lucia Giraldi terminated their campaigns. CD15 Democratic Jayson Ortiz filed petitions to run on the Republican and Conservative lines in November. CD16, challenger Niyyirrah El is challenging incumbent CM Vanessa Gibson isn’t a CFB participant. Ms. El last faced off against Gibson in the 77th Assembly District during the 2010 Democratic primary. CD17, Patrick Delices is mounting a challenge on the GOP line in November. CD 18, Democrats John Perez and Dwayne Gaithers abandoned the race. Also, Gaithers terminated his campaign and CFB account. Green Partty candidate Carl Lungren filed petitions to appear on the November ballot. Primary elections are scheduled for September 12, 2017, and the general election will be on November 7, 2017. Empire State Humane Voters announced its support of Democrat Amanda Farias for City Council. “Amanda Farias is a friend to the animals of NYC, and we are proud to endorse her candidacy for City Council,” said Allie Taylor, Founder and Executive Director of Empire State Humane Voters. ESHV’s mission is to elect candidates who support animal protection, lobby for stronger laws to stop animal cruelty, and hold elected officials accountable to humane voters. The NYC District Council of Carpenters endorsed Assemblyman Mark Gjonaj and his campaign to represent District 13 in the City Council. The Transport Workers Union Local 100, announced their endorsement of Assembly Member Robert J. Rodriguez in his campaign for City Council in District 8. Bronx Progressives, an outgrowth of Bernie Sanders’ unsuccessful presidential campaign, endorsed three insurgent city council candidates: John Doyle in District 13, Randy Abreu in District 14 and Michael Beltzer in District 18. Bronx Progressives works for community empowerment and progressive political and electoral reform. Last Friday, State Senator Gustavo Rivera and Assemblyman Victor Pichardo joined with a number of city agencies and local health institutions to co-host their fourth annual Senior Health Fair at Monroe College. As part of Senator Rivera’s Bronx CAN Health Initiative, attendees received health screening, ate healthy food and got moving with Zumba. 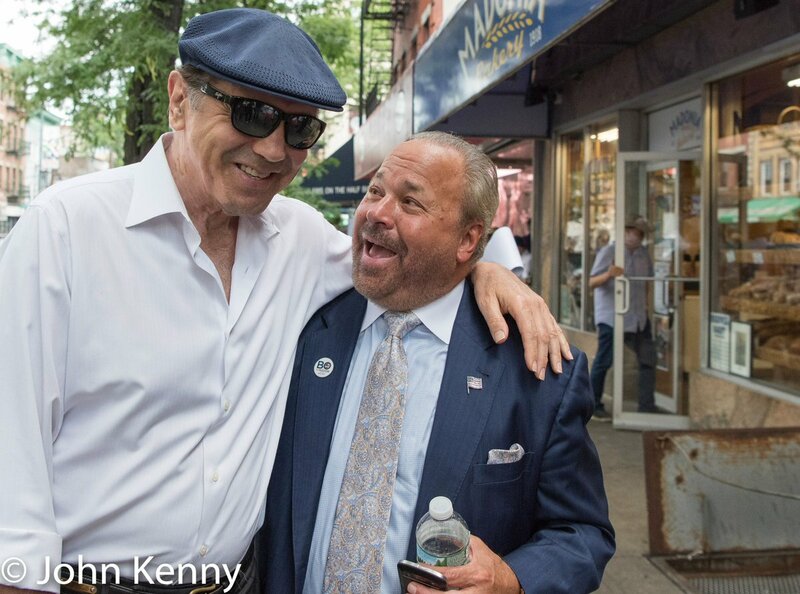 Former NYPD detective Bo Dietl, who toured Arthur Avenue and City Island last week, says he’s no longer seeking the endorsement of the City’s Republican party and will run as an Independent candidate in November. Last week, Dietl said had become appalled by the backroom politics of the city’s GOP county committees. Dietl had originally planned to run in the Democratic primary but voided his registration form by checking off both the Democratic and Independence Parties. Where in the World is Michael Blake? On Saturday, Assemblyman Michael Blake delivered remarks at the National Democratic County Officials Annual Reception at the Greater Columbus Convention Center in Columbus, Ohio. On Sunday, Blake was in Washington, DC for the #Voices4RESULTS International Conference. City Comptroller Scott Stringer has no public schedule. 7:00 PM/10:00 PM Mayor de Blasio will appear on NY1’s Road to City Hall. 9:00 PM “BronxTalk” features Bronx District Attorney Darcel Clark, BronxNet, Lehman College, Goulden Avenue, Bronx. July 25 – TAPCo Public School of the Arts is hosting a ribbon cutting unveiling a beautiful 4,000 sq. ft. mural highlighting the diversity and challenges faced by the mental health community in the Bronx, 5:30 pm.